According to the Mail on Sunday, mouthwashes are a major health hazard. I’m not convinced. Using mouthwash is a ‘disaster’ for health, increasing the risk of heart attacks and strokes, scientists are warning. Professor Amrita Ahluwalia, who led the study, last night condemned the widespread use of antiseptic mouthwash. More than half of British adults regularly use mouthwash, creating a market worth £180 million a year. The study compared blood pressure levels in 19 healthy volunteers who started using Corsodyl twice daily. Their blood pressure rose by between 2 and 3.5 units [mmHg]. The story is based on this and it quickly becomes clear that the situation is a little more complicated than the Mail on Sunday makes out. The rise in blood pressure may not seem like much considering that ideally healthy blood pressure is in the range 90/60 to 120/80 mmHg systolic/diastolic but for sufferers of high blood pressure any increase can be dangerous. This leads to the first point about the study; the participants are healthy individuals in their twenties. It might seem reasonable to assume that what applies to this group also applies to heart patients in their fifties but it is still an assumption that cannot be categorically stated as true without tests. The study participants measured their daytime and night-time blood pressures and the changes over the study period are shown in graph form in figure 5 of the paper. It can be seen that while a few rise steeply, the majority change very little and some actually fall. General conclusions drawn from this small sample are starting to look a little tentative. Shaky, even. Another problem with this study is that there is no placebo arm. When a patient is given a placebo and allowed to believe that he has actually been given a real drug, his symptoms will often improve, and sometimes dramatically so, at least in the short term. So researchers need to compare their drug against the strong effects of a placebo before they can claim that the drug is really effective. 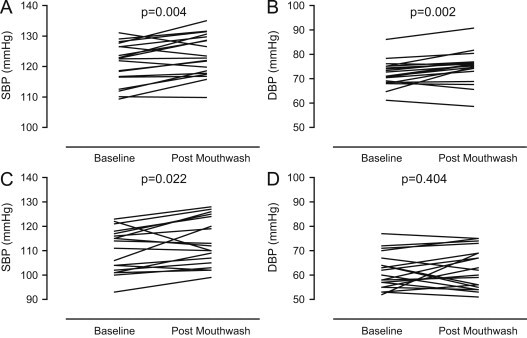 In other words, a second group of participants should have been given a placebo mouthwash and the differences in blood pressure changes (if any) between the two groups examined before any kind of meaningful conclusions can be drawn. It is important to appreciate the limitations of this work. In this study the application of the intervention was not randomized and not placebo controlled. Unfortunately this subtle point has been missed by the press reporting which, as is all too often the case when the press cover medical and scientific matters, consists of a tiny kernel of truth wrapped in layers of hype and glossing over of nuance. Don’t dump your mouthwash just yet. This entry was posted on January 27, 2014 at 9:46 pm and is filed under Bad Science, health. You can follow any responses to this entry through the RSS 2.0 feed. You can leave a response, or trackback from your own site.